Cut away the green leaves from the cauliflowers. Divide each head into small florets by breaking rather than cutting them apart. Weigh them. For every 450g, you will need to dissolve 55g salt in 600ml water. Wash the florets, shake dry and soak overnight in the brine. Slowly bring the vinegar, spices and bay leaf to the boil, then cover and leave for 2 hours or overnight. The next day, drain the florets and rinse very thoroughly in plenty of cold water. Leave to drip dry in a colander, then tightly pack in 3 sterilised 500g kilner jars. Leave 2.5cm free at the top as it is vital that the florets are completely covered by the vinegar. Add the cold vinegar and divide the spices and bay leaves equally between the jars. 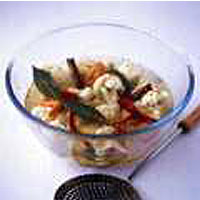 Make sure that the vinegar covers the vegetables by at least 1cm, as it will evaporate gradually. Do not let it come into contact with the lid. If you are using screw-top jars, only use those with plastic coated lids, metal tops can corrode. Leave for 2-3 months in a cool, dark place before eating.